For a while now we, here at Atlanta IT Service, have been waiting for a device that would give the iPad 2 a run for its money. There have been some close contenders but most have suffered too many shortcomings to hold a candle to the iPad 2. Now, however, there is a more than credible alternative: The Samsung’s Galaxy Tab 10.1. If you’re thinking about buying a “cream of the crop” tablet, these two devices would be the big contenders from which to choose. Here’s a comparison based on the most consumers’ deciding factors. Both manufacturers can take home the crown for having the thinnest tablets on the market, though for what it’s worth, the Samsung Galaxy Tab 10.1 is a hair thinner and a few ounces lighter than the iPad 2. This is mostly due to the Ipad’s brushed steel back lining which a lot of folks prefer over that the Galaxy’s sheer plastic panel. 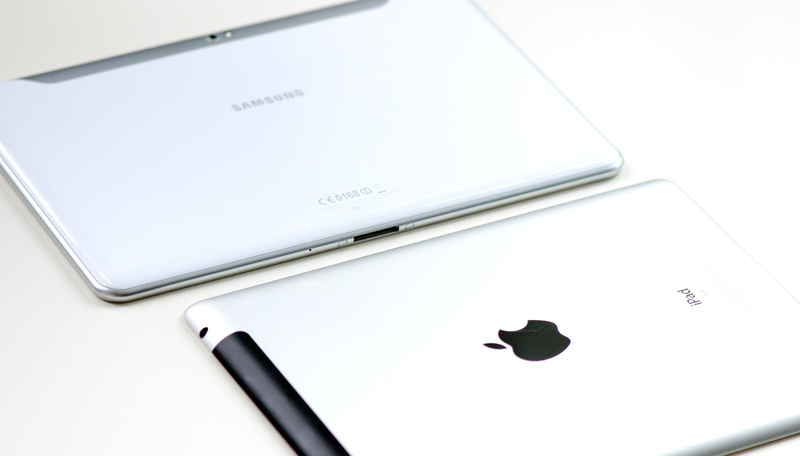 As far as the screen goes, the Galaxy’s 10.1″ screen surpasses the iPad’s 9.7″. Both have remarkably vivid color production and graphics; however The Galaxy’s 1280 x 800 pixel resolution enables notably deeper color toner and richer contrast. The iPad’s display is limited to 1024 x 768 but in no way “skimps” on detail and luminance. Both the dedicated power buttons and volume rockers on the two tablets are distinguishable to the touch, while offering a sensible amount of feedback when pressed, but the iPad 2’s buttons jut out just a tiny bit more. In terms of other ports, they both flaunt proprietary data/charging connectors and 3.5mm headset jacks. Both have front and rear facing cameras capable of video chatting and taking photos, though the Galaxy Tab’s 2MP(front) and 3MP(rear) cameras are just nicer than the iPad’s 0.3MP(front) and 1MP (rear). The iPad 2 has a single speaker located on the back corner of the tablet, while the Galaxy Tab 10.1 offers stereo support with its left and right speakers. Since most other android smartphones had the edge over apple devices as far as removable and upgradable storage, we were naturally expecting their tablets to have tha same capailites. We were wrong ,however, to find that just like the iPad2, the Galaxy tablet’s batteries are not user removable and will require you to send it out it they require servicing. Additionally, neither tablet provide any means of supplementing their internal storage capacities – meaning, you’re stuck with however much storage memory was in it when you bought it. Both offer a 16GB and 32GB variety but only the iPad 2 will have a 64GB version. As far as applications, both Tablets are able to download and run most of the same apps as the other. This is, of course, with exceptions but many have said that the quality of apps at the iTunes App Store is far better compared to the Android Market. This is perhaps due to the fact the iTunes App store is geared more towards selling, and hence, the need for developing a consistency of high quality apps. Quality has a price and this is holds true for both markets. Apple has always kept a tight grip on what Apps are marketed in its App Store. However, the guys at Google have encouraged creativity among their developer base. There certainly is a greater chance for developers getting their apps to see the light of day on the Android Market compared to people who always have to get Apple’s approval. Don’t worry though, Angry Birds is and will always be available on both platforms. Whew. Both devices are packing 1GHz dual core processors so, needless to say, they won’t have any problems running their respective operating platforms. When it comes to navigating the home screen interface and launching apps though, the iPad 2 seems a bit more graceful and streamlined with its window animations. Getting into the entire performance experience though, it’s always comes down to personal preference. Since the iPad 2 isn’t quite as customizable as the Android Honeycomb OS, many people find it easier to use. More “power user” oriented users tend to prefer the complexity of the android OS which provides more personalization in widgets, home screens, and U.I. settings. You can easily run multiple tasks with both devices but the Galaxy Tab “takes the cake” in better implementing notifications. Because The Galaxy Tap has Adobe Flash support, it offers more of a true desktop experience with web browsing. Although it’s lacking against the iPad 2, it still delivers a resounding experience seeing that it’s easily more fluid with its navigational operation – like kinetic scrolling and pinch zooming. Complex pages load in a timely manner with both, but the Galaxy Tab 10.1 has a few more features, like Flash support and incognito mode, that rounds out its overall appeal. Simply put, both devices are outstanding in performance and design so your choice really boils down to picking one or the other that is best suited for how you intend to use it. If you prefer a bigger display for watching movies, viewing photos, and taking pictures; the Samsung Galaxy 10.1 make be your best bet. If a simplistically sleek and easy to use interface is more “up your alley”, the iPad2 is a no brainer. Unfortunately, we all can’t purchase two of every new device for the purposes of comparison, but if the one you end up with lives up to your personal demand, you’ve once again made the right choice.